Last year, right around Super Bowl time, I noticed more talk and hype about Buffalo wings than I ever remembered hearing before. The media was obsessed with them. My Facebook page was littered with recipes for them. I couldn’t get away from them. I finally succumbed and decided to make some on Super Bowl Sunday, more to be cliché than because I really wanted them. Don’t get me wrong: I absolutely love Buffalo wings — the hotter, the better. But let’s face facts: deep fried, with the chicken skin and fat intact, and all that butter in the sauce…they simply aren’t very good for you. Somewhere in the Buffalo wing media frenzy I found a recipe for baked wings, which sounded a little healthier than deep frying them. They were easy to make and every bit as tasty as their deep fried counterparts, and I have included steps to make these as baked Buffalo wings here. 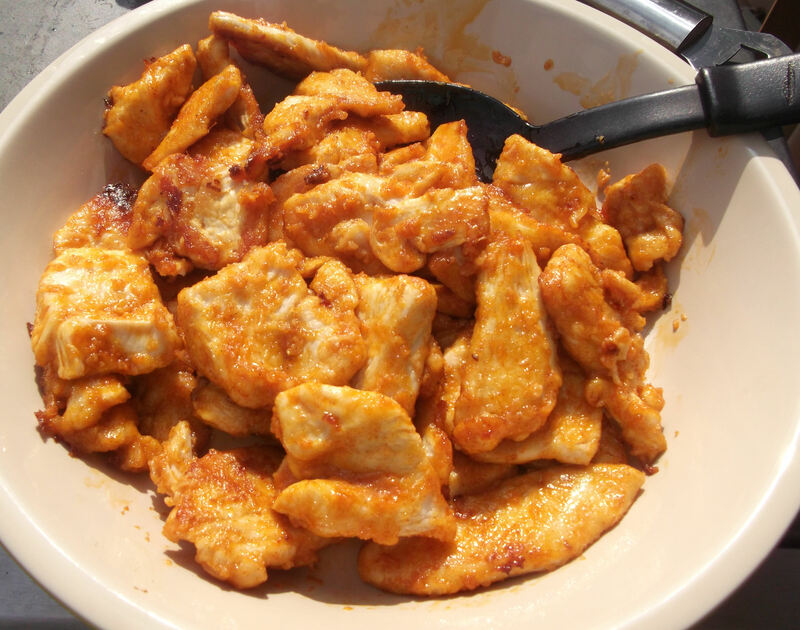 However, I really wanted to get away from the wing and skin aspect, so I made them even more healthful by using chicken breasts instead, pounded thin and sliced into tender bite-sized pieces. In addition, I scaled back on the butter, and even substituted a little butter-flavored extra virgin olive oil. 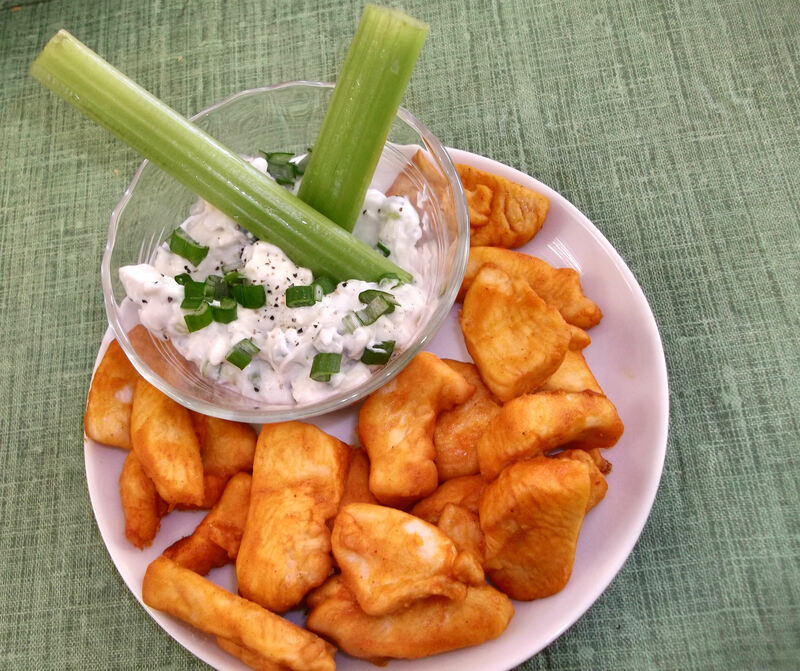 Buffalo (chicken) fans will love this recipe either way: as wings or tenders. And if you love pizza, save some of these tenders to make my Buffalo chicken pizza! Preheat oven (or outdoor grill) to 400 degrees F.
Mix the flour, cayenne, garlic powder and salt in a gallon-sized resealable plastic bag and shake to mix. 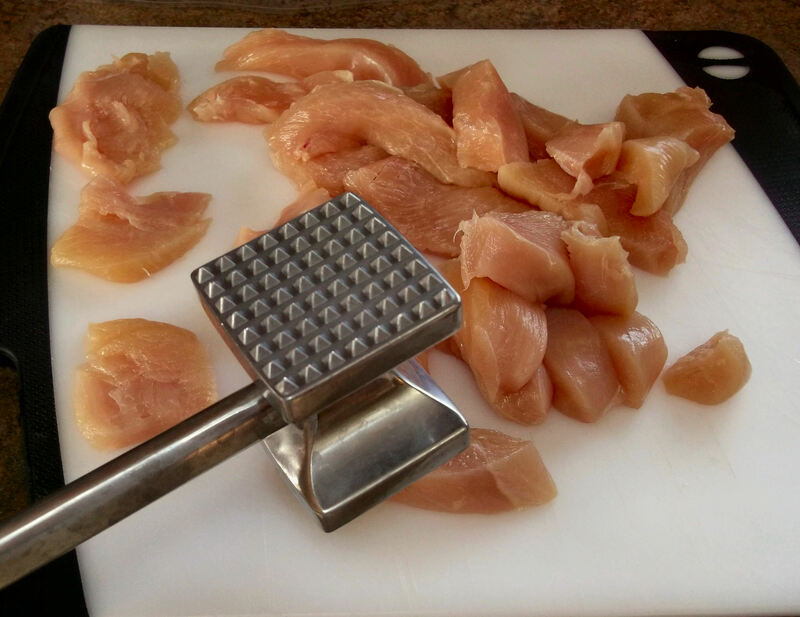 Pound the chicken breasts to a uniform thickness (optional) and slice thinly into 2” long strips. Add the chicken pieces to the bag, seal, and shake until well coated. 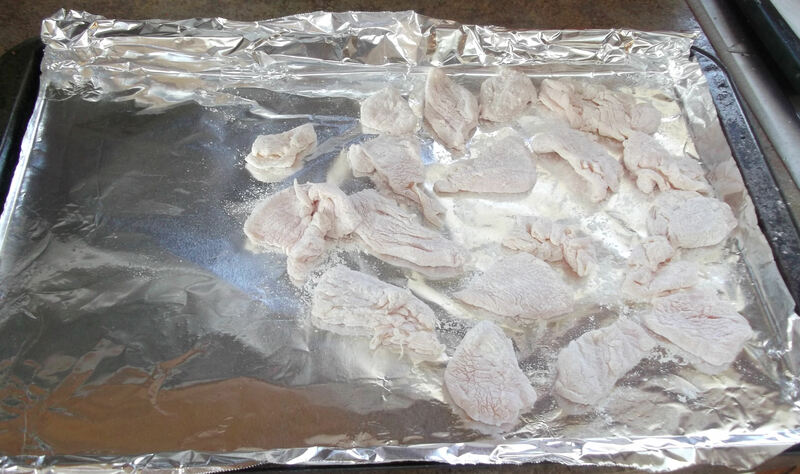 Line a baking sheet with aluminum foil and lightly spray it with cooking spray. 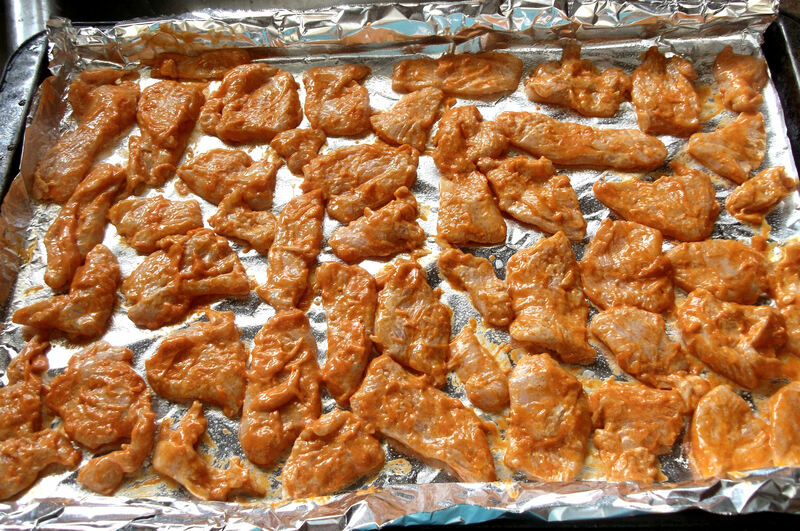 Place the chicken strips onto the foil-lined baking sheet and place in the refrigerator for at least one hour. In a medium bowl, combine the bleu cheese sauce ingredients. Mix well and set aside. In another bowl, whisk together the melted butter, olive oil (if using), and hot sauce in a small bowl. Serve with sliced celery and bleu cheese sauce on the side. Prepping the chicken can be done a couple of ways. Either slice each breast into small pieces, and, if you don’t mind a little extra work, you can pound those pieces into thin strips. Alternatively, you can pound each whole breast to a uniform thickness, and then slice each of those into strips. Make them as long or short as you want. Add the pieces to the bag of seasoned flour. Seal it and shake it well until all the pieces are coated. Then place the floured chicken onto the foil-lined baking sheet, and put the sheet in the refrigerator for at least one hour. Next, make the bleu cheese sauce: In a medium bowl, just combine the ingredients and set aside. Next, make the Buffalo sauce. Whisk together the melted butter, the butter-flavored extra virgin olive oil (if using), and hot sauce in a small bowl. (I don’t recommend using regular olive oil here, as I think its flavor would be too strong. The butter-flavored oil works great and makes great popcorn-popping oil, too!) 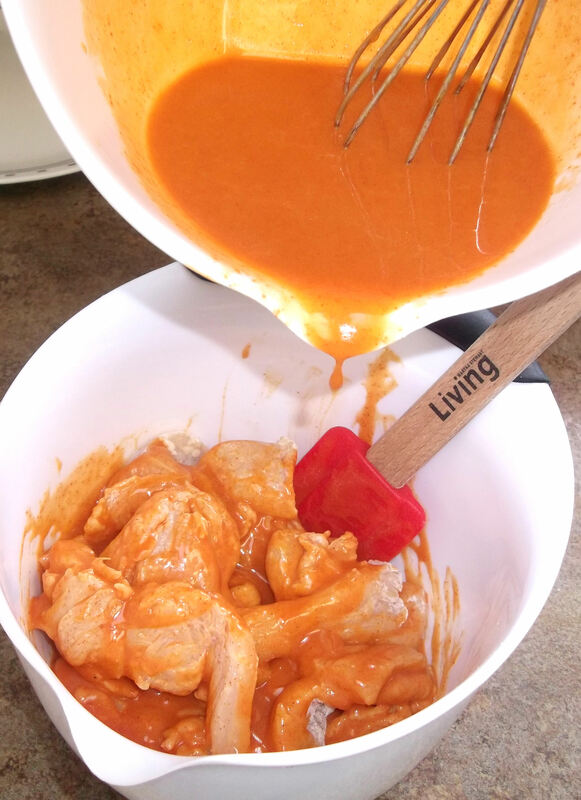 But I digress… whisk the sauce until smooth and evenly blended. Place the cooled, floured chicken strips into a bowl and pour in just enough of the hot sauce mixture to stir and evenly coat all pieces. Reserve the rest of the sauce for dipping. Pour the baked tenders into a bowl or onto a plate and just throw away the foil. Talk about super easy cleanup! Serve with celery and bleu cheese sauce on the side. Enjoy! Note: if you like things a little more spicy, serve the reserved Buffalo sauce on the side as well, or simply drizzle it over the tenders. Enjoy! 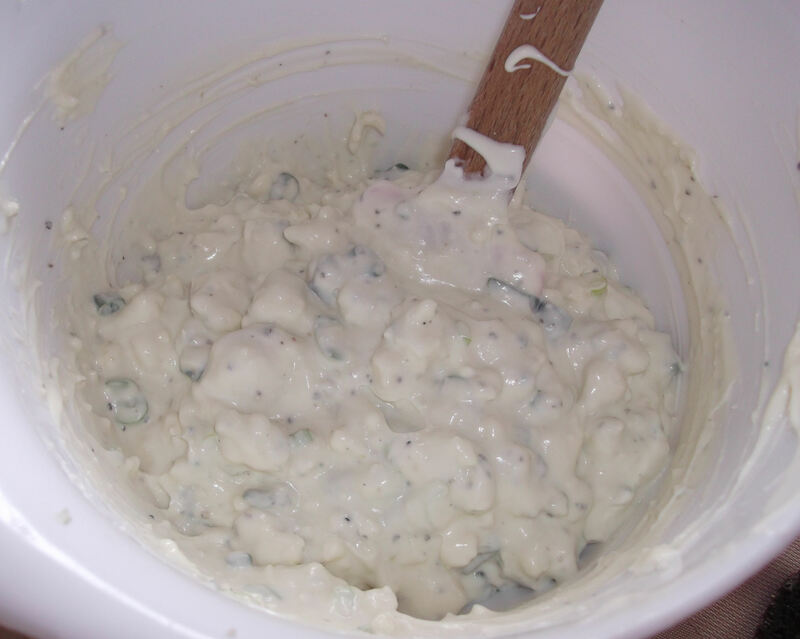 Bonus tip: whisk some milk into any leftover bleu cheese sauce to make homemade bleu cheese salad dressing. Start with ½ C of milk and add more as needed to get the desired consistency. This looks like a semi-healthy alternative to the deep-fried version, I’ll be sure to give it a try. I wonder where the tradition came from to add bleu cheese and celery? Are there any other interesting ways we might serve these spicy chicken strips to give it a new twist? Love your blog and especially the step-by-step instructions and pictures. I love the Olive Grove! I never knew the difference between real olive oil and grocery store olive oil. I must have 7 different flavors of olive oil and a couple balsamics (hubbies)and their sesame oil. If you like sesame oil at all you must try theirs, beyond amazing, I could drink it. We have these and the confit down to try. Thanks for the recipes. Thanks for the tip on their sesame oil. I’m due for some “refills” of other oils, so maybe I’ll pick up one of those. Hope you love the wings and the confit! Congrats on the mention in The Olive Grove mailer!